This past weekend I got to spend two days learning Cowboy Dressage with Master Parelli Professional Don Halladay alongside other fantastic Parelli Professionals - Todd and Maureen Owens and Randee Halladay. 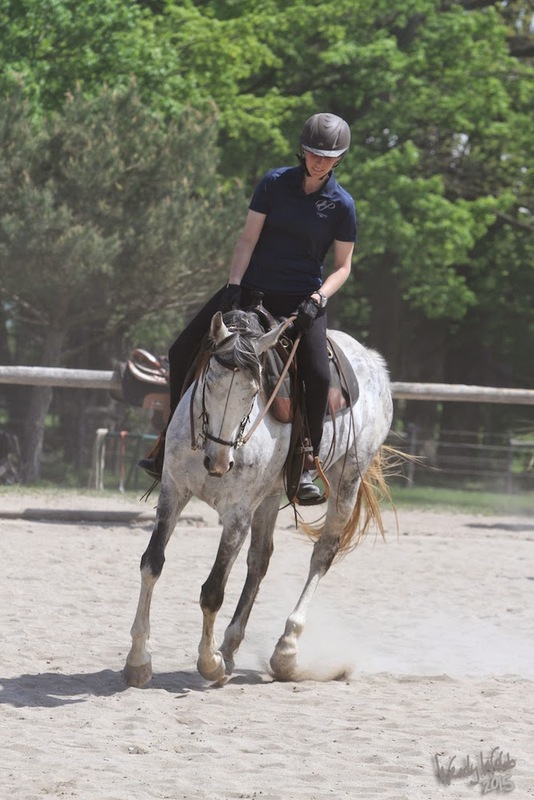 It was extra exciting because I brought Kahleesi, my off the track Thoroughbred mare that I am training for the retired racehorse contest being held in Kentucky later this year in October. It was Kahleesi's first time going off property with me, and my first time trying Cowboy dressage. Kahleesi was fantastic and really surprised me with how well she can learn and 'click' with me. I've been working on getting her to stretch and relax for a few rides with a bit, but this was the first time I tried the cradle bridle with the Myler C2 bit. She really loved it and started to stretch and take contact the best she has ever done. We practiced many different things on day 1 including shoulder and haunches in, leg yields, transitions, backing up a hill, etc and Kahleesi was really good. 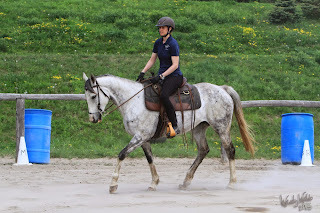 On day 2 we put a purpose to these patterns and tried riding a couple Cowboy dressage tests - just simple walk/jog tests but it was great to put a purpose to all the exercises we were learning. The only thing Kahleesi was truly scared of were the speakers - so we will have to work on exposing her to more things and sounds, but by the end of day 2 she was doing much better and able to ride near them... on day 1 we were doing some pretty fancy half pass away from them -but she was never really bad or scary... she just didn't know if the boxes were going to eat her. 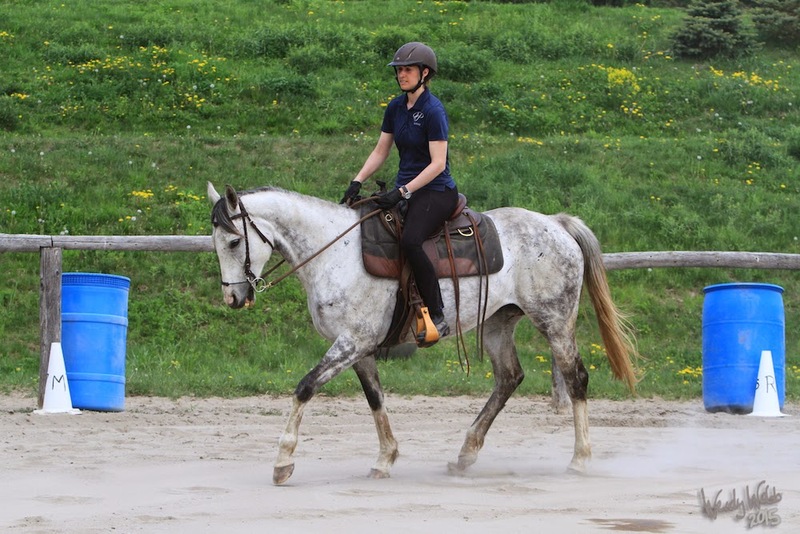 Get the foundation: be accurate and precise in the foundation movements like moving the shoulder and haunches (forehand, haunch turns, sideways) so that when you go to do the more advanced movements like haunches in and shoulders in or a half pass that your horse really understands what you are after. Go slow and get it right. Have a purpose: it's really important to have a goal, vision, or purpose to what you are doing. 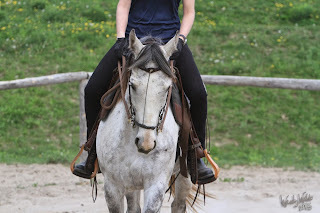 It makes life interesting for you and your horse. 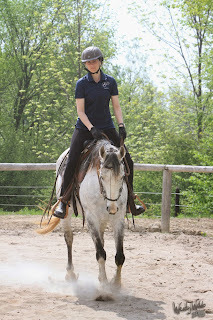 Learning the movements is one thing, but working towards a whole pattern makes it more fun for the horse. Doesn't Kahleesi look lovely? Cupid is my other TB for the makeover contest, so it will be his turn next to try a clinic! FEEL - Session two.... aka super creepy!